In the past year, theatrical rocker Madame Mayhem has won over the North American metal press. Case in point, her most recent album, ‘Now You Know,’ being included on Loudwire’s top 10 video picks, and having received rave reviews from BraveWords, Loudwire, New Noise Magazine, Revolver Magazine, and more. Soon, the UK and Europe are about to experience the unforgettable music of Madame Mayhem – as ‘Now You Know’ will be released on Friday, August 26th via Metalville. And as it turns out, the European rock press is already feeling Madame Mayhem’s presence, as a marketing onslaught is already underway, with ads placed in such publications as Metal Hammer Magazine Germany, Rock It Magazine Germany, Sweden Rock Magazine, Aardschok Magazine, and This Is Rock Magazine Spain. The Manhattan-born Madame Mayhem has collaborated with notable rock talents including Grammy winner Mark Hudson, Earl Slick (David Bowie, John Lennon), Rudy Sarzo (Ozzy Osbourne, Quiet Riot, Whitesnake, Dio), Elliot Easton (The Cars, Blondie), John Moyer (Disturbed), and more. 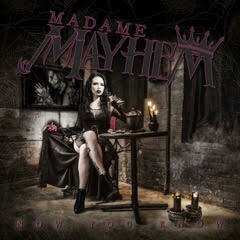 Madame Mayhem’s endorsements include Samson, ACS Custom, Ultimate Support, Wornstar, and TC-Helicon, with more to come. Brace yourself Europe, you are in for the unmistakable metallic assault of Madame Mayhem! [separator style=”line /] Check out our photos of Madame Mayhem by Maq Brown! DYING FETUS Release Cryptic Video Teaser – Vinyl Reissues Available Now!